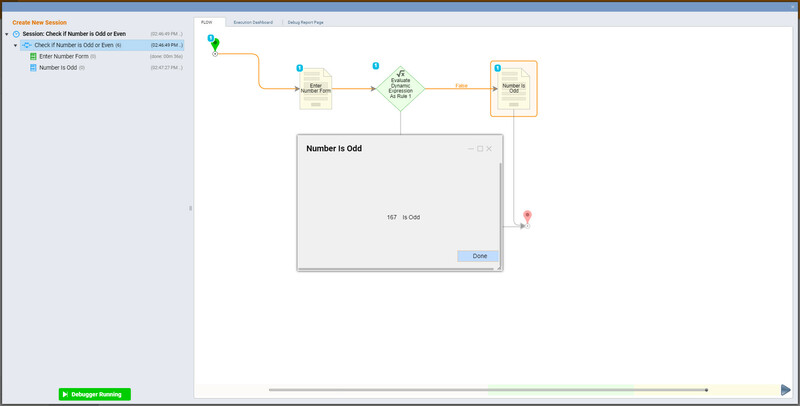 Expression Steps	are specially designed to evaluate calculations in one step within a flow. 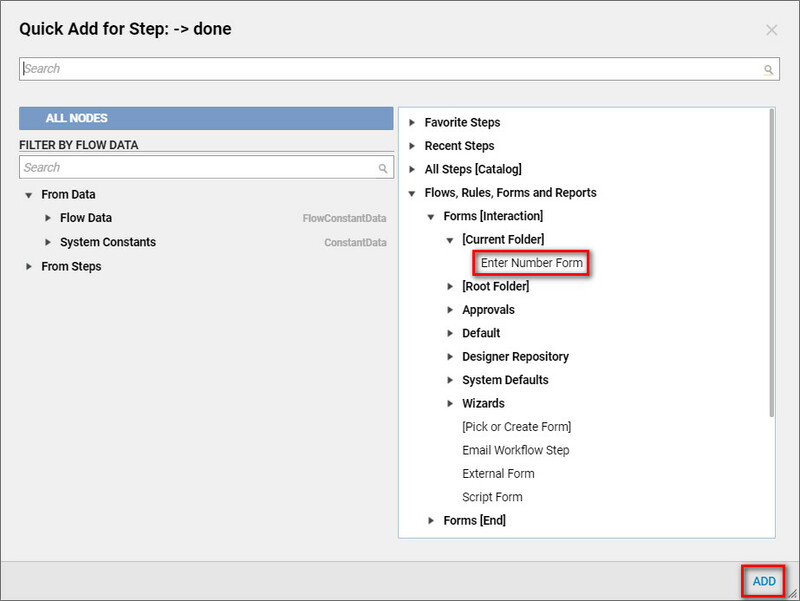 These steps can be found under Data > Numbers	category in the Toolbox in the Flow Designer. The Evaluate Dynamic Expression As Rule Step	is unique in the way that it allows end user to pass some values into an expression which makes it dynamic. The other key feature of the output of this step is the Type Boolean . In this example we will create the flow that let&apos;s the user input a number and tells the user if the number is odd or even. We begin with navigating to the Designer Folder and selecting Create Flow	. TheEnter Number form was designed for this example. We locate Enter Number form in flow designer&apos;s start-up window under Flows, Rules, Forms and Reports > Forms[Interaction] > [Current Folder]	and click Add	to add it to the workspace. Enter Number Form is designed as follows... It has a title that is a Label	. It has an Action Button	to proceed as well. Also, It has a Label	and a Number Box	for user&apos;s input. Under Data > Numbers	category locate Evaluate Dynamic Expression As Rule Step	and drag it to the workspace. Connect it to the Enter Number form&apos;s outcome. 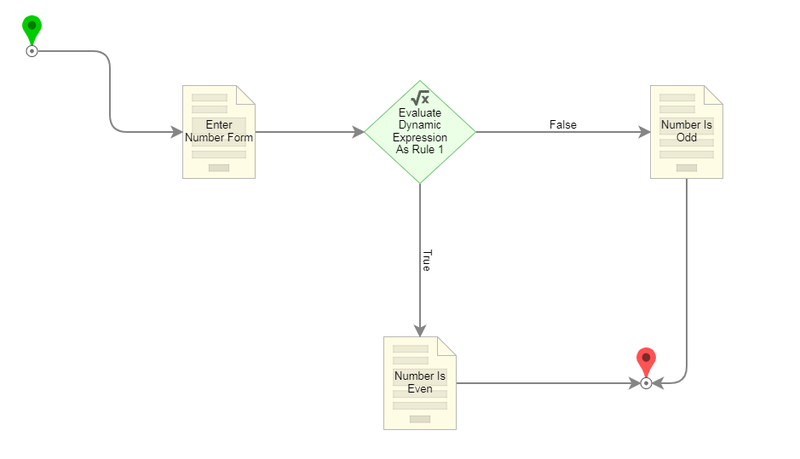 Remember that Evaluate Dynamic Expression As Rule Step	has two outcome paths because the outcome should be Boolean . From the Edit Step	dialog we select Merge Plain Text	from the inputs action menu. Next, we click Show Editor	to open Merge Text Editor	. In the Merge Text Editor	we select the plus sign button when hovered over Number	from the Data menu which refers to the user&apos;s input. Next we finish our formula that defines if the number is odd or even. In this case, the formula defines if the number is even, so the true outcome path should tell the user that the number is even. We click SAVE	to close and save Merge Text Editor. 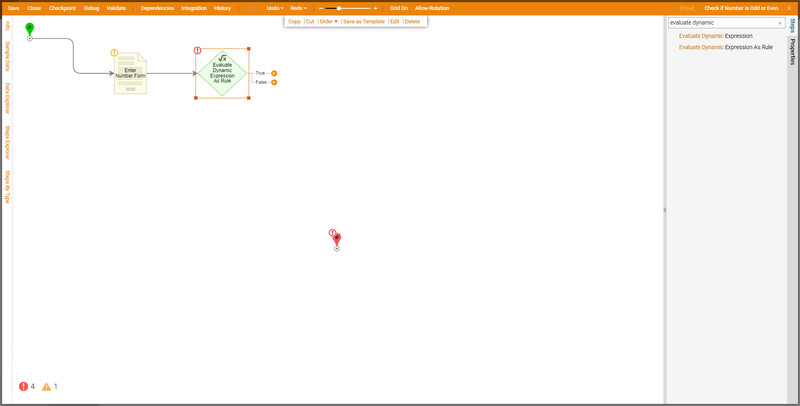 We can click Ok	to save and close Mapping Editor and return back to our Flow Designer. Next we create or drag to the workspace Number Is Odd Form and connect it to the False outcome from Evaluate Dynamic Expression As Rule Step . The Number Is Odd Form is designed as follow... 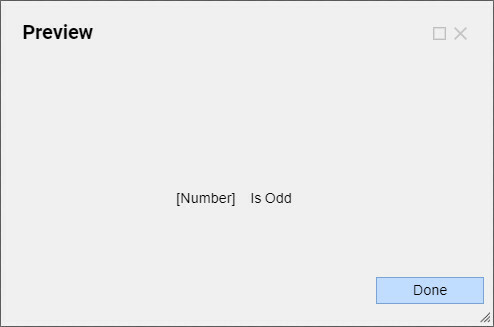 It has an Action Button	to close the Form and two Labels	to inform the User that the number is odd. 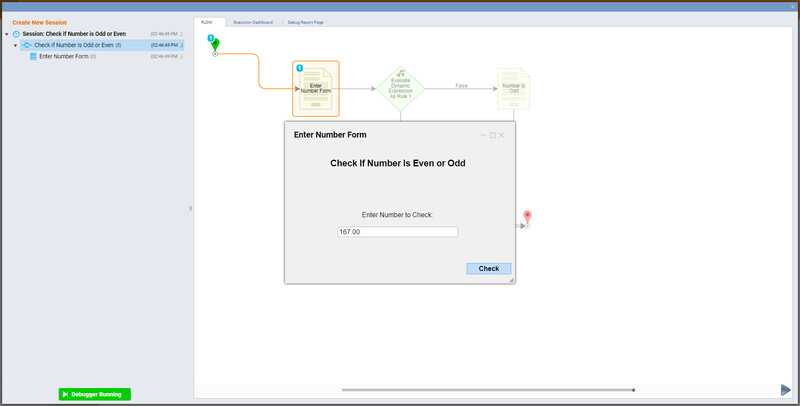 One of the labels is created from the Flow&apos;s Data Value to show the Number that User Input. 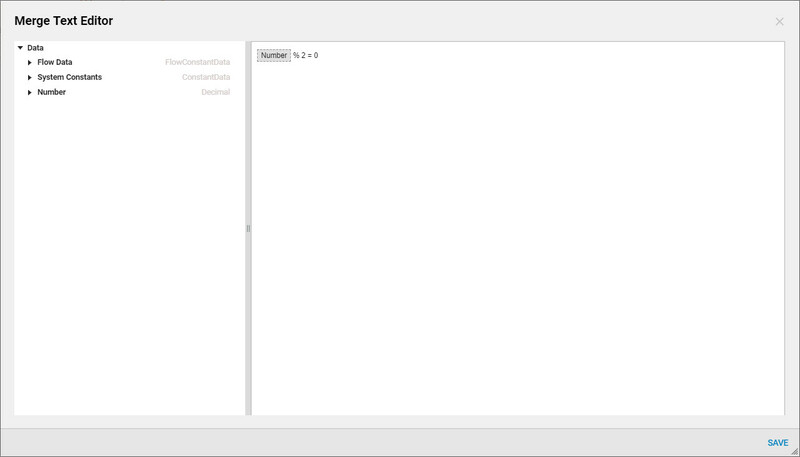 Next, we drag or create Number Is Even Form to the workspace. This form is designed the same way as Number Is Odd Form . 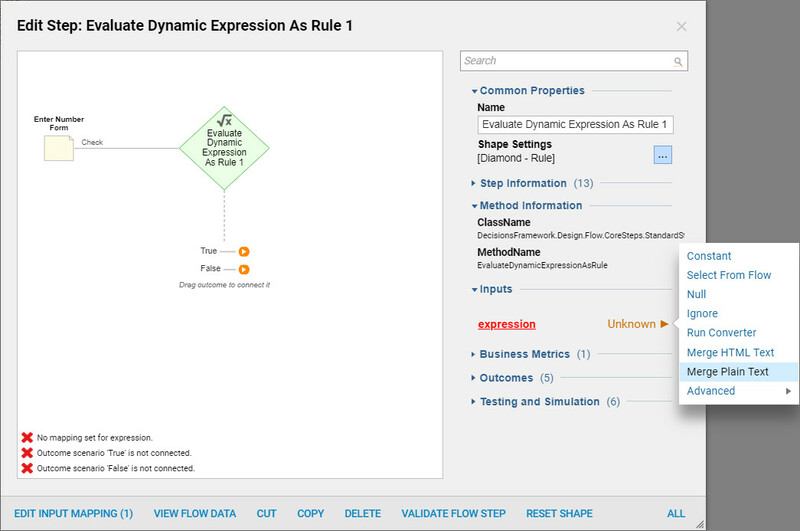 We connect this form to the true outcome from Evaluate Dynamic Expression As Rule Step	. Next we can connect all steps as follow. This completes our Flow. 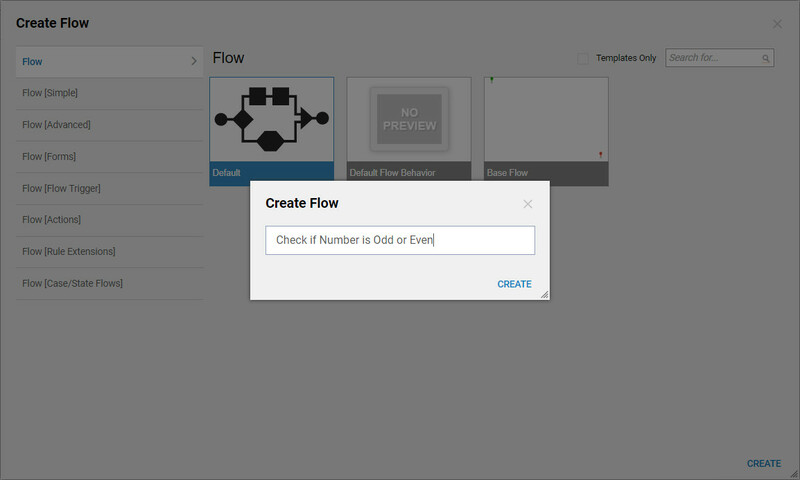 Click Debug Flow	link from the top panel of the Flow Designer to test our Flow. 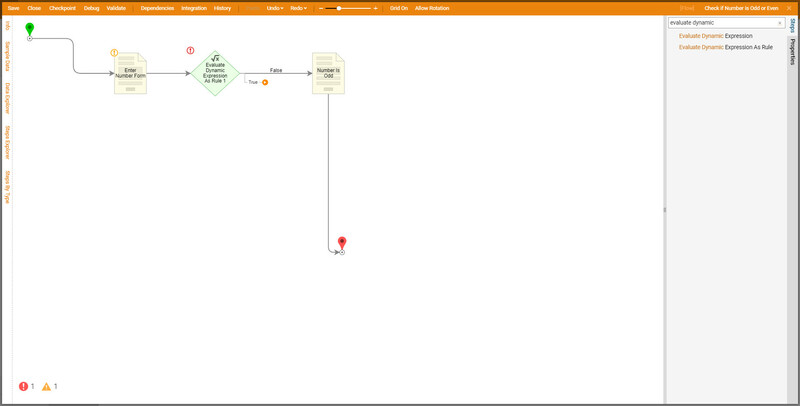 Note that in Decisions version 3.5, you&apos;ll need to click the Test Flow	link to access the Debugger. 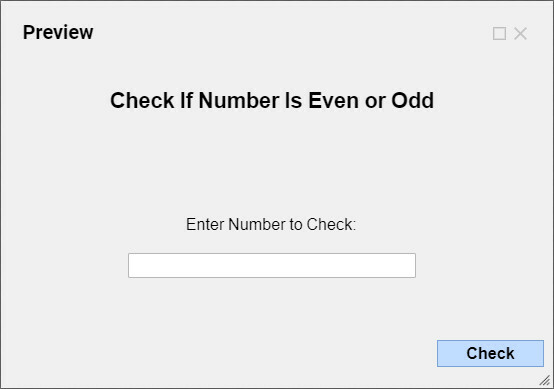 Enter an o dd number in the first form in the debugger and click Check	to check it. The Result Form shows us the number we&apos;ve input and tells us that it is odd. Click Done	to close this form. 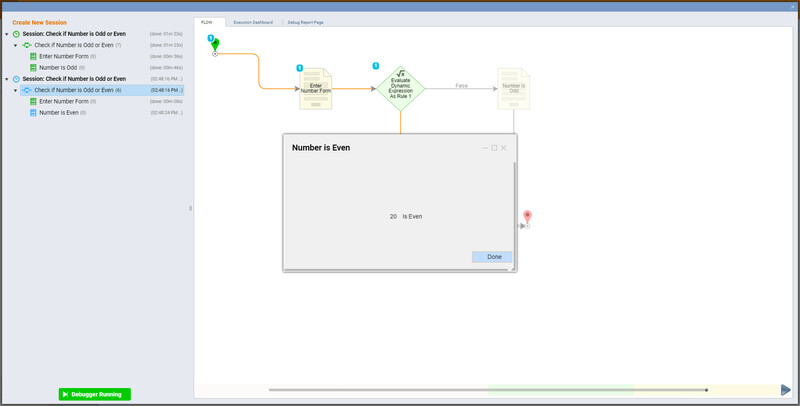 Next, rerun the flow in the debugger by selecting Create New Session	and enter the even number. Click Check	to check it. Result Form shows us the number we&apos;ve input and tells us that it is even. Click Done	to close this form.